Panhandle PBS will bring Cat in the Hat back to the region in February. The dapper kitty, one of Dr. Seuss’ most beloved creations, will be in the area from Feb. 2 to 9. Storytelling at Amarillo Public Library Downtown Branch: Kids can enjoy stories, take photos and do a creative activity with The Cat at this free event from 3 to 4 p.m. Feb. 3 at the downtown library, 413 S.E. Fourth Ave. Call 806-378-3054 for information. Storytelling at Killgore Memorial Library in Dumas: Kids can share stories and more with The Cat at this free event from 10 to 11 a.m. Feb. 6 at the Dumas library, 124 S. Bliss Ave. Call 806-935-4941 for information. Family Night at McDonalds: The Cat will be available for photos at this dinnertime event from 6 to 7:30 p.m. Feb. 7 at the 4402 Teckla Blvd. location. Amarillo Bulls Night: The Cat will appear at a public skate between 5 and 6 p.m. Feb. 8, then greet visitors at a Seussville meet & greet from 6 to 7 p.m. He'll also appear on the concourse between periods of the game with the Lone Star Brahmas. VIP tickets are $25, including admission to the skate, meet & greet and the game. Call 806-242-1122 for tickets. Photos at Panhandle-Plains: Kids can take pictures with their favorite whimsical kitty between 1 and 4 p.m. Feb. 9 in Pioneer Hall, near the gift shop at Panhandle-Plains Historical Museum, 2503 Fourth Ave. in Canyon. Admission for the event is free, and the museum will offer reduced admission of $5 from 1 to 5 p.m., also in connection with its ongoing Hearts for Art promotion. Call 806-651-2244 for information. The Cat in the Hat's visit is made possible with support from McDonald's of Amarillo and the Amarillo Bulls. The Cat in the Hat Knows a Lot About That! is an award-winning program and website that is designed to spark a love of learning and an interest in science and math for preschool-aged children. The program airs on both Panhandle PBS’s primary channel and PBS Kids 24/7 channel. 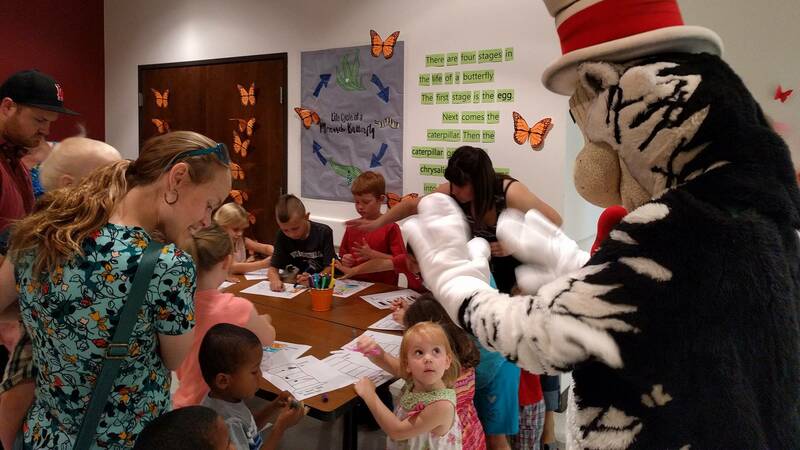 Bringing Cat in the Hat to our region helps connect Panhandle PBS viewers to the program while helping us meet our mission of providing trusted community engagement to educate, enlighten, entertain and empower the people of the Texas Panhandle. Visit panhandlepbs.org or call 806-371-5479 for updates on his schedule.